Edward The Black Prince. 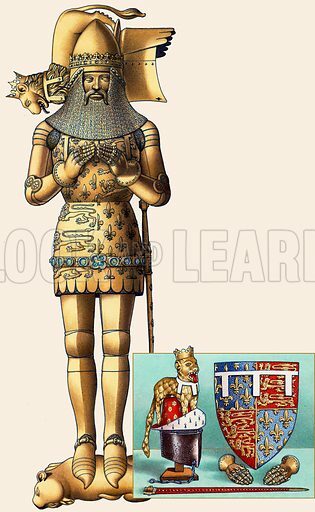 The gilt-bronze effigy is of Edward the Black Prince and is on his tomb in Canterbury Cathedral. He died in 1376, and the effigy shows a good example of the armour of his day. The smaller picture shows copies made in the Tower Armouries of the Prince's "achievements", which hang over his tomb. The originals may be seen nearby. Original artwork for illustration on p20 of Look and Learn issue no 495 (10 July 1971). Available worldwide for immediate download up to 3,138 x 5,099 pixels.